THEY may be still in school but students at Stuartholme School, Toowong, already know a thing or two about town planning. Three Stuartholme students have won prizes for their age group in the annual Planning Institute of Australia Awards for Plan-ning Excellence. The school dominated the Outstanding Student Project Award secondary category with Alexandra Gilley, Bridie Nicholson and Christie Moloney making up half the prize winners in the category. 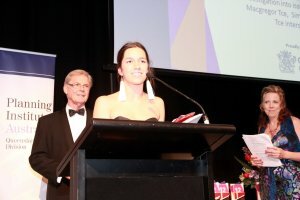 Alexandra, a Year 12 student, was named the overall category and Excellence Award winner for her investigation into the issues and management of Macgregor Terrace, Simpsons Road and Jubilee Terrace, Bardon, near the Stuartholme campus. Judges recognised the “exceptional quality” of Alexandra’s work and praised her for an innovative topic choice, sound methodology, and comprehensive and detailed approach to the subject. Stuartholme senior boarder Christie Moloney’s entry questioning the planning behind Cramsie-Muttaburra Road in Longreach was recognised by the judges for its importance in “raising awareness of transport planning within a regional and rural context”. She, along with fellow Stuartholme boarder Bridie Nicholson, who submitted a plan for Taringa Railway Station, were awarded Certificates of Commendation. Stuartholme head of social science Wendy Bolton congratulated the students and said the entries were all major assessment items for the girls’ geography class. “To have so many entries and finalists from our school is an endorsement of the girls’ wonderful efforts in this area of geography,” she said. Mrs Bolton said Alexandra’s work would now be forwarded to the national judging panel for consideration as part of the National Awards for Planning Excellence.